We finally had a nice quiet week at home. We had nothing on our calendar and I made sure it stayed that way. We have so much fun going on field trips and getting to meet new homeschoolers but I could tell the boys were just as sick of gallivanting all around as I was. We enjoyed a quiet and laid back week at home focusing more on our book work and housework. Self- Help/ Life Skills-- We finally got back to our routine of cleaning just a bit of the house each day. The boys have helped clean the whole thing top to bottom. We also wrote up a new chore chart adding a few new chores like loading and unloading the dishwasher as well as switching up the jobs. Evan asked me to teach him how to use the washer and dryer this week so he's been helping with laundry too. Evan finally grew and got some shoes with laces so we've been working on getting him to tie his own shoes. We've also started getting back into our routine of having each boy pick a night to help plan and cook dinner. Alec helped me make a new creamy tomato linguine dinner one night and then I sort of dropped the ball on having the other two help; but we have already planned their recipes for next week. Alec and Evan wrapped the Christmas gifts they bought for their brothers and fathers (early I know but I usually wait until just before Christmas to do this with them and it's never easy remembering who bought what for whom!). Reading/ Language Arts-- Evan read A Pet for Fly Guy, Carl's Christmas, How Rocket Learned to Read, and Bang. Ian went back to reading Divergent and finished up a couple of chapters on his own. He also checked the movie out of the library and we re- watched it, comparing it to the movie. Alec finished up his Humphrey book, read the entire Ice Fire book, and started reading The Accidental Hero and Fire Star. He's so excited to find out that the Last Dragon Chronicles series is made up of 6 books and not 3 like we originally thought. The older boys worked with their spelling words and lists while Evan worked on 6 more pages in his Star Wars book dealing with nouns and proper nouns. The older boys each worked on some cursive too. All three boys wrote up their wish lists/ letters to Santa. I was surprised to find that Evan needed little help in sounding out everyday words and managed to look up the names of the boys he wanted on Amazon. Ian decided to type his letter so he got some practice in on using the computer and learning to type too. We listened to a bit more of our book on CD: The Empire Strikes Back So You Want To Be a Jedi and found out that this to is part of a series. Geography-- Houses around the world! We read the book If You Lived Here and then I challenged the boys to use materials around the house to create some of the houses pictured the book. You can read all about it here. Math-- All three boys did a few timed worksheets this week dealing with recalling facts. They also worked in their math workbooks completing two more pages each day. We played a few math games too. We played Yahtzee working on multiplication and addition. We played Pirate Code Lego game; working on problem solving and breaking codes. History-- We finished reading Cracker! The Best Dog in Vietnam and Who Was George Washington. We just loved Cracker! It was such a wonderful story with a happy ending. It gave a pretty accurate portrayal of war in Vietnam without being too gory or graphic for the boys. That completed our mini unit on Vietnam and we turned our attention to the dust bowl and the great depression. We've found a lot of wonderful books but we're still looking for some movie ideas if anyone has any! Science-- We spent an afternoon checking out objects under our microscope. We looked at salt, pepper, thread, ear wax, egg shell membrane, egg yolk, salt water, a piece of a paper napkin, and orange pulp. It was so neat and the older boys were more than happy to fill in a chart drawing what they saw. 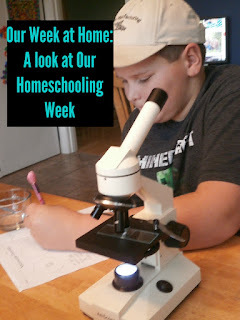 We also put together this list of 100 things from around the house and yard/nature that we'd like to study using our microscope as the year goes on. Art-- Alec and I spent another afternoon looking through the Spot the Difference Art Masterpiece book and examined Degas' The Dance Class, Jan Van Eyck's The Arnolfini Portrait, Paul Gauguin's The Meal, and George Seurat's Bathers at Asnieres. We talked about pointillism, impressionism, and learned a bit about the dining customs in Tahiti. We also searched the internet for some fun fall and Thanksgiving crafts that my older boys might like to make. We put together this list of 10 craft ideas for middle school. After making their houses the boys had fun playing around with Play- Doh making up "recipes," buildings, cars, and animals like this adorable elephant (and yes, he is pooping... what can I say but "Boys!"?). Your weeks always sound so fun! Yahtzee... Another game I'm adding to our amazon wish lists! Thank you! I do try and keep things as fun as possible. My oldest son loves Yahtzee; probably because he's the reigning champ with 3 yahtzees in one game. He's the one that convinced me it's a great math game with all the adding. Aren't Amazon wish lists grand?! What a productive week at home. It does feel good to get a productive "at home" week in once and a while. Enjoy the week. It really does. Thank you, I hope you enjoy your week as well.